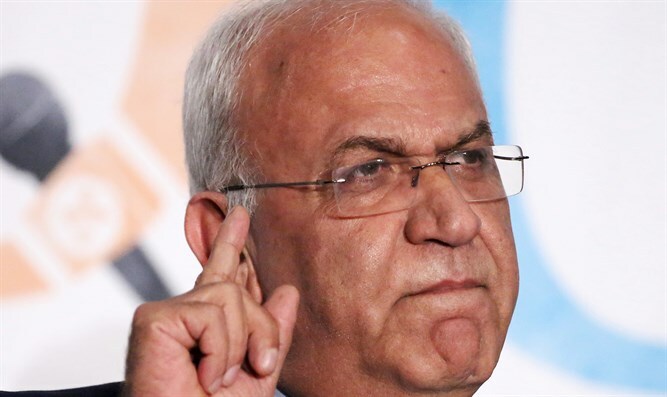 PLO's Erekat blasts approval of Regulation Law, says it proves Israel wants to destroy the chances for peace. The Palestine Liberation Organization (PLO) on Monday blasted the Regulation Law, which passed its second and third readings in the Knesset, saying it is a means to "legalize theft". In a statement, PLO Secretary-General Saeb Erekat said “the Israeli parliament has just approved a law to legalize theft of Palestinian land. Looting is illegal. All Israeli settlements in Occupied Palestine are illegal and a war crime regardless of any law passed by the Israeli parliament or any decision taken by any Israeli judge. Under the law, homes built on such properties will be allowed to remain, and owners with proven claims to the land will be given a choice of receiving an alternate plot of land or monetary compensation for 125% of their land's value. While Erekat accuses Israel of “destroying the two-state solution”, he is ignoring the fact that Palestinian Authority (PA) chairman Mahmoud Abbas has consistently refused to negotiate directly with Israel. Abbas has ignored Prime Minister Binyamin Netanyahu’s calls to sit down for direct talks, choosing instead to impose preconditions on talks.